There are two features that can be used to distinguishing the tank families: The roadwheel placement and the exhaust ports. The older and smaller T-55 and T-62 have five roadwheels in their suspensions, the later models have six roadwheels. The T-55 and the T-62 can be identified from the spacing of the roadwheels. The T-62 has the gaps between roadwheels increasing towards the rear, but on the T-55 the front roadwheel of is separated from the rest. The T-55 and T-62 can also be identified from the smoke evacuators in their main gun barrels. T-55 has the bulging part at the muzzle of the 100mm barrel, while T-62 has a similar component at the middle of its 115mm barrel. 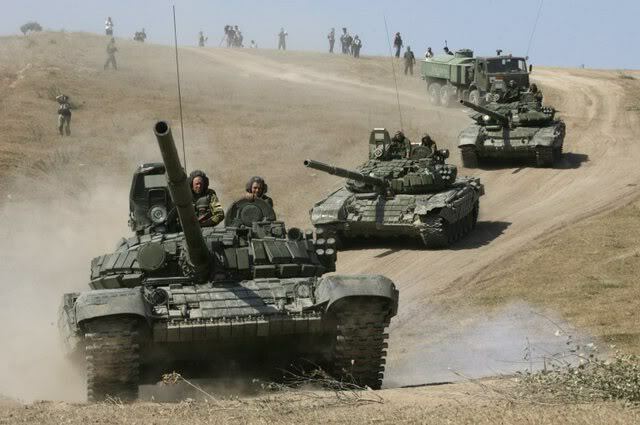 The more modern T-72 and T-90 have the same suspension layout with six large evenly spaced roadwheels and they can easily be identified from the T-80 models as they have six smaller wheels grouped in pairs and the T-64 has completely different suspension layout with very small roadwheels. T-80 and T-64 are easily separated from each other by the fact that T-80 has a searchlight on the right side of the barrel, while the similar light is mounted to the left side on T-64 variants. The other way of identifying the tank platforms are the engine exhaust ports. These can also be used to separate T-72 and T-90 from each other. The T-64 and T-80 series tanks have a horizontally opposed diesel engine and a gas turbine engine respectively, both with large exhaust ports at the rear of the tank. The other platforms have diesel engines with exhaust ports on the right side of the tank. The active duty T-72 and T-90 variants all have ERA armor with several of them sharing the same layouts, identifying the apart can seem a bit daunting. But there are some details that make the task easier. T-90 differs from all mass produced T-72 variants in two distinct ways. It has the Shtora-1 anti-missile system. Shtora-1 has two easily identifiable emitters mounted on both sides of the barrel, in Russian service this feature is only found on the T-90A and T-80UK. The other feature are the exhaust ports. T-72s have a long and low exhaust port, while the T-90 one is distinctly boxy, T-72BA may also feature the boxy exhaust port, but it can be easily identified as shown below. Out of the two dozen T-72 variants developed, the Russian Armed Forces presently use the T-72B, T-72AV, T-72B obr 1989, T-72B1, T-72B3 and the T-72B3 obr 2016. These tanks can be easily separated into two groups. The T-72B, T-72AV and T-72B1 all use the older Kontakt-1 ERA bricks that are not integrated into the tank like the never Kontakt-5 (or externally almost identical Relikt) ERA found on the other models. In order to separate the most modern and lethal T-72B3 from the other two Kontakt-5 equipped tanks you must look at details on the turret. The T-72B3 has a symmetrical ERA layout and no searchlight on the right side of the main gun barrel. There is also one more ERA brick on the right side of the T-72B3 than there are on T-72BA and T-72B obr 1989. The T-72B3 also has the Sosna-U optical sight on top of its turret, that is conciderably higher than the 1K13-49 sight found on the T-72BA and T-72 obr 1989. The T-72B3 and T-72B3 obr 2016 are mostly similar, but the T-72B3 obr 2016 has extended ERA coverage at the skirts and cage type slat armor protecting the rear of the vehicle. There is also a variant of the T-72B3 without the ERA slabs on the skirts and a variant of the T-72B3 obr 2016 with a bag mounted ERA/Applique armor on the skirts. The T-72BA and T-72 obr 1989 are even more alike, but they have one easily identifiable difference. The newer, or at least more recently modernized T-72BA features a more advanced fire control system that has a meteorological sensor mast at the back of the turret. The T-72AV has a more V-shaped ERA array on the turret than the T-72B1 and T-72B with ERA that have the same armor layout. The T-72B1 uses the same older optics than the T-72AV. The T-72B on the other hand has the more modern 1K13-49 sight that can be identified from frontal pictures. Russia has manufactured a T-72B1 variant with the Sosna-U sight, but at the moment it has been only delivered to Laos and Nicaragua, it is not in Russian use. There are two T-62 variants that have seen the light of day in the past few years, while there may be other models hidden in the endless storage dumps in Siberia. The active reserve variants are the T-62M and T-62 MV. T-62M has one spaced applique armor panel on the both cheeks of the turret. T-62MV has Kontakt-1 ERA bricks covering the turret and hull. It' also possible that a T-62MVs have their ERA bricks removed during storage, but they still retain hedgehog like spikes for their mounting. T-55M has one spaced applique armor panel on the both cheeks of the turret. T-55MV has Kontakt-1 ERA bricks covering the turret and hull. There are more modernized T-55 variants with different main guns and even Kontakt-5 ERA, but these are not in Russian service in meaningful numbers. Not that the T-55M designation is also used on various export variants and upgrades by other operators, for example the Finnish T-55Ms are very different from the Russian ones.